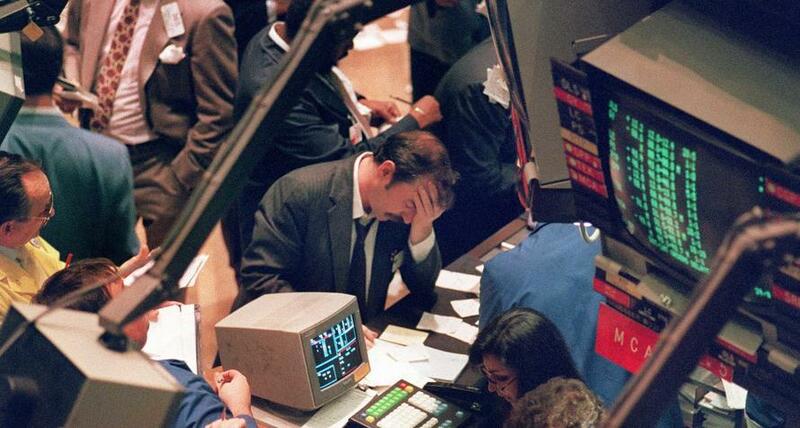 Morgan Stanley: "Current Events Remind Us Of What Happened In Autumn 1987"
When one strips out the noise, to predict what will happen in capital markets one needs to know just two things: what happens to interest rates and company profits. And, in a time when central banks have injected $15 trillion in liquidity to paper over the fatals flaws from the great financial crisis, this means that the question ultimately reduces to just one variable: what happens to liquidity. 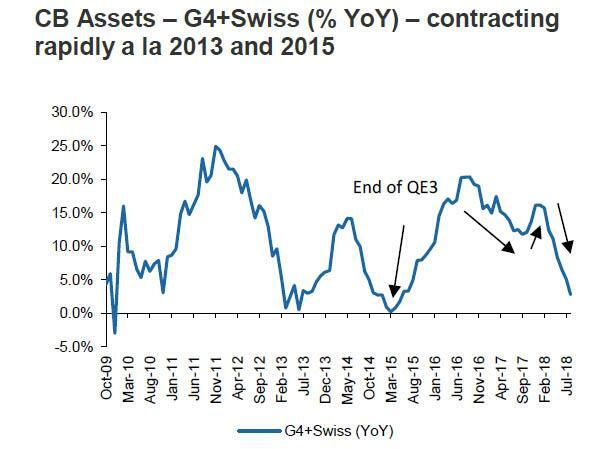 And while global liquidity is still generous, it is rapidly shrinking as one central bank after another either phase out QE or engage in all out tightening. However, not all is well in the markets where "rolling bear markets" have now become the norm as one asset class after another experiences a sudden, sharp liquidity shortage, and as Morgan Stanley's Hans Redeker writes this morning, often volatility divergence has been witnessed within late cycles. He recalls when liquidity concentrated in Japan from 1987-89, in the US during the 1999-2000 Nasdaq-boom, and then in the EMU just before the US subprime crisis in 2008: to Redeker, these liquidity concentrations were the result of tighter global liquidity conditions no longer covering all risk aspects. One place where liquidity is scare this morning is the one-month CNH HIBOR rate, which jumped 79bp to 7.13% – the highest level since June 2017 – and the three-month CNH HIBOR rising 42bp to 6% is a second-round effect of liquidity concentration in the US, the Morgan Stanley strategist notes. There is a reason for this artificial liquidity shortage: as the USDCNH has appreciated towards the previous high of 6.97, the PBoC is driving interbank rates higher to make it more expensive to short CNH in order to stabilize the currency. Rising interbank rates therefore suggest investors have increased expectations for USD strength, leading towards a possible liquidity squeeze. And while the PBOC believes it is protecting its currency, it is unwittingly releasing adverse second-order effects such as rising volatility, which is a function of liquidity and with bond volatility breaking higher, it seems that US liquidity conditions have finally rolled over. 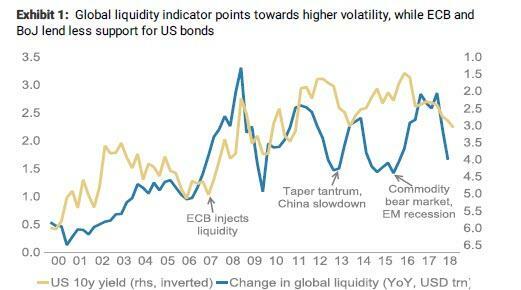 Redeker notes that the bank's liquidity indicator (consisting of G4 central bank balance sheets, global FX reserves and EMU, Japan and China’s current account balances) has broken lower, which could explain the recent surge in US bond yields and the steepening US yield curve. Here one should note that QE disconnected bond yields from liquidity indications, but with QE now in the rear view mirror, weakening global liquidity conditions have to increase the cost of capital, driving bond volatility higher. The most direct confirmation of the growing liquidity scarcity is that US equity markets have finally come under selling pressure, and are showing early symptoms of more weakness as investors have shifted aggressively from cyclicals into defensives. Meanwhile, despite broadly weaker share prices, gold has stayed offered, supporting the view that the current market setback is driven by tighter liquidity pushing capital costs and thus asset funding costs higher. Higher funding costs affect gold and shares likewise. US 10-year real yield has reached its highest level since 2011. We wrongly assumed that EM weakness would spill over into the US, following the 2015/16 playbook. There are two differences to 2015/16. First, the US economy deployed an output gap in February 2016 when the Fed pulled markets away from pricing in aggressive Fed rate hikes. Second, there was no fiscal stimulus in 2016 increasing the resilience of the US economy to negative global spillover effects. Hence, the risk-negative effect has to come out from a different direction, namely higher capital costs gradually undermining the funding position of risky assets. This is why we put emphasis on the recent rise in US bond volatility. And speaking of rising bond volatility, Redeker notes that all eyes are on bond volatility, i.e., the MOVE Index, for one reason: while rising FX and equity volatility can remain isolated events, rising bond market volatility tends to steer other volatility indices too. Hence, rising bond volatility makes a difference when volatility for risky assets diverged on the back of liquidity concentration in the US. Concretely, FX and non-US equity volatility – notably EM – broke away from lower US volatility readings previously. The Fed was hiking rates, deploying a hawkish tone. Chair Greenspan had just taken office, providing hawkish rhetoric, and the global economy seemed to trail the better US performance supported by the second Reagan tax package kicking in in 1986. The consensus assumed the rest of the world (RoW) – notably Europe – was running wider output gaps and hence was surprised when the Bundesbank withdrew liquidity in September 1987. In this sense, we would not dismiss hawkish remarks from ECB's Knot, who said that ECB rate hikes could come earlier than markets are expecting. With just ten days left until October 19, will central banks pull the rug from under the market once again? ... highlights the impact of easy ECB and BoJ policies on yield differentials since 2013. 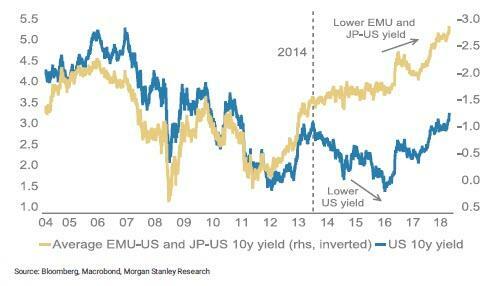 Specifically, easy ECB and BoJ policies helped keep US yields lower for longer. Now this anchor may be removed as ECB and BoJ policies are set to turn more hawkish. Redeker's conclusion: "Risky asset markets may head towards troubled waters and currencies should be traded accordingly."